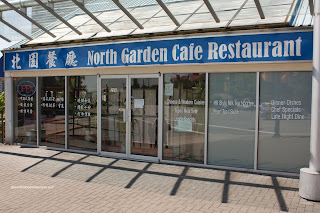 For the longest time, we have avoided North Garden. I'll admit it. We were influenced by what others have said about the place. Honestly, I often wonder if businesses understand the "word of mouth" principle. If you build up a poor reputation, it'll catch up to you sooner or later. So with all the bad vibes about the place, we just didn't feel the need to try it out. However, that has never stopped me before since each individual experience is different. Although I put considerable trust with my friends in terms of their tastes and opinions, it is best that I find out for myself. So, with a little trepidation, we were hoping this w asn't going to be a Kawawa. 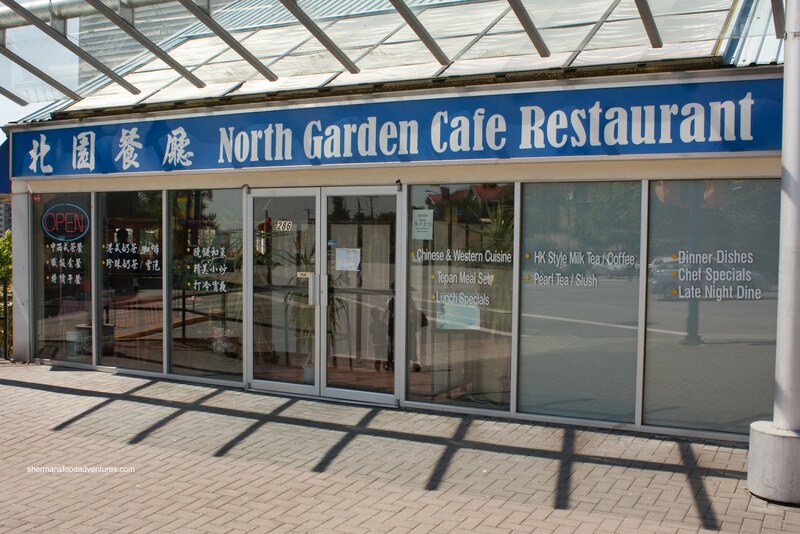 As much as North Garden is a Chinese restaurant, complete with Peking Duck on the menu, it doubles as a Hong Kong-style Cafe. Located in the former Lonestar (long gone BBQ restaurant), it is a relatively spacious restaurant with high ceilings and plenty of natural light. Despite the this, the laminate floors have definitely seen their better days. Some renovations might do wonders here. Although we were only here for lunch, I was actually pretty hungry and went for their 4-Item Combo. I opted for the Beef Steak, Pork Chop, Chicken Steak and Fried Imitation Scallops. I had a choice of sauce and chose black peppercorn. As always, the meal started with the Chinese version of Borscht. With no beets whatsoever, this is pretty typical. 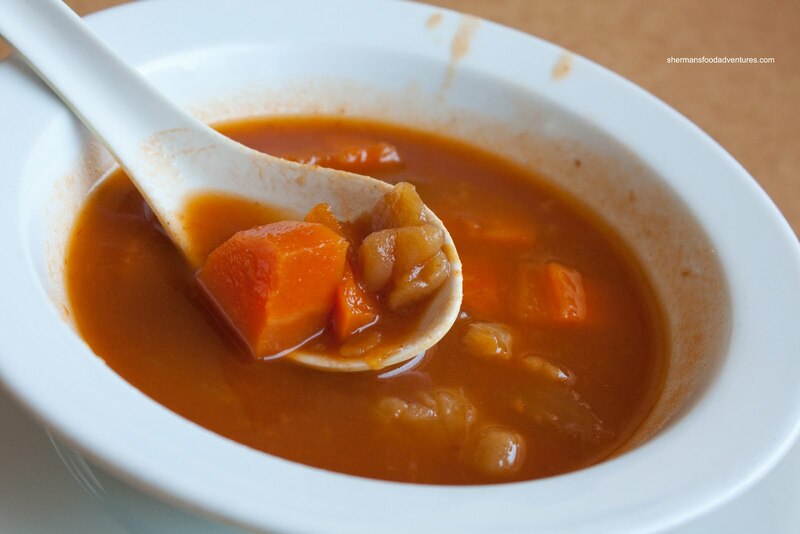 The Hong Kong-style cafe take on borscht is vegetable soup with a few drops of Worcestershire sauce. With that in mind, this was pretty standard stuff. As for my meal, the meats were prepared surprisingly well. I asked for my steak to be rare and it was exactly that. Hence, the thin minute-steak was not tough at all (probably tenderized). The chicken steak, which is a deboned leg, was juicy while the pork chop was slightly dry. As for the "scallops", they were fine if you were expecting fried pollack. I found the peppercorn sauce to be kinda weak. It was more of a gravy of sorts than being peppery. I really liked the veggies, they were vibrant and still crisp. Viv chose another HK-style cafe favourite in the Baked Pork Chop Rice. It is a fried pork chop on top of fried rice and baked with a diluted ketchup-based sauce. Sounds sketchy I know; but if done right, it is one of my favourites. This one was pretty good in my books. The fried rice was dry, which is a good thing since there is an abundance of sauce already. The sauce itself was mildly sweet with some tomato tartness. 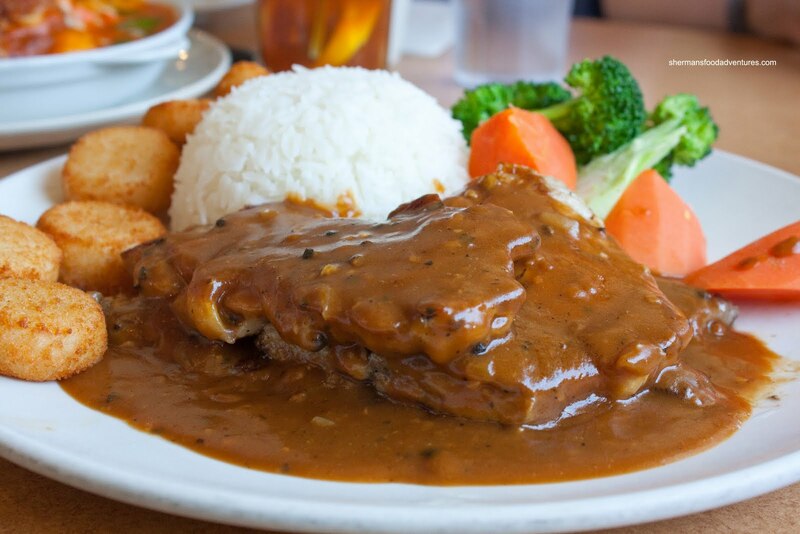 We found the pork chop to be moist and meaty with a slight crunch on the sides. For the kiddies, we got the Pickled Greens and Pork Vermicelli. Once again, this was a pretty typical version of this soup noodle. 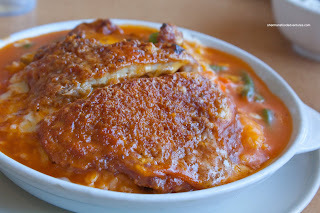 I thought the tenderized julienned pork was the perfect texture (which is slightly chewy while still super tender). 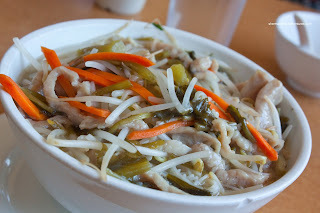 Combined with the right amount of pickled snow cabbage, it was a good compliment to the al dente vermicelli. The so up was somewhat bland; but that didn't matter since there was enough flavour from the other ingredients. Seeing how we didn't get to try their dinner items, we returned the next week with the whole family. We ended up with the dinner for 4 which included a choice of soup. 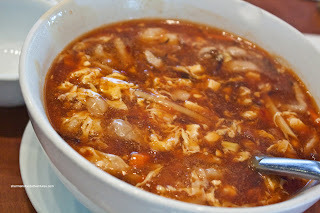 We went for the Hot & Sour Soup since we could safely assume the wonton soup would not be great. From the rich colour to the ample ingredients, this was a respectable hot & sour soup. It was definitely tart and plenty spicy. 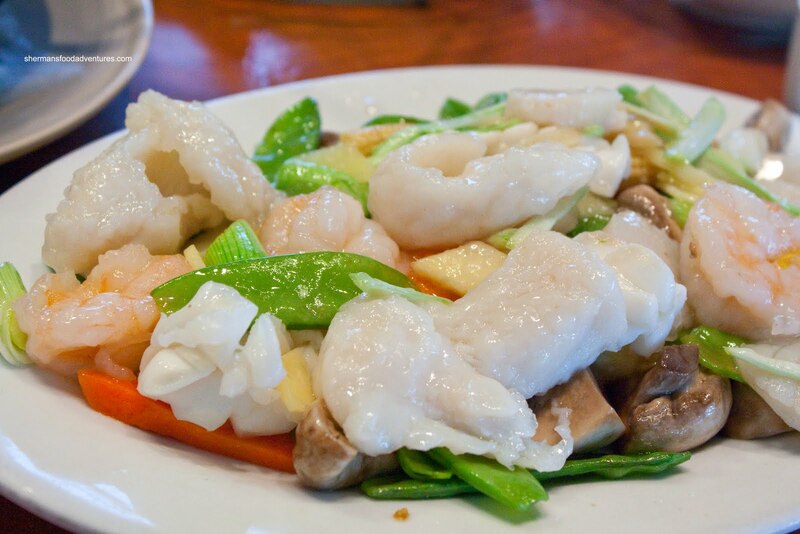 For our first dish, we had the Stir-Fried Seafood with snow peas. With a bevy of properly cooked basa, prawns and squid, this was a pretty good value considering it was included as an option for the "build-your-own-meal". The peas were also cooked properly being vibrant and crunchy. 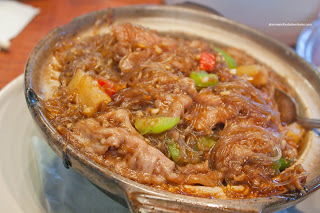 Next up was the Satay Beef with Vermicelli Hot Pot which arrived nice and hot. Too bad there wasn't much liquid left, which made the vermicelli a bit clumpy. Well, at least that is better than soggy vermicelli I suppose... There was a good amount of properly tenderized beef mixed with peppers and pineapple. Although there was sufficient seasoning, I would've preferred this to have more satay flavour. It didn't exactly scream out spice. Now for a dish that might confuse people who have never seen it before. 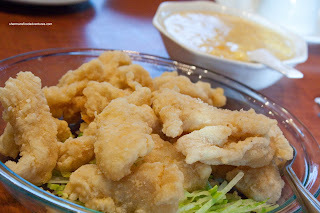 The Fried Fish with Cream of Corn Sauce may not exactly sound that appetizing; but if you grew up eating it... Yes, it really is merely fried pieces of basa with a side of diluted and thickened canned cream of corn. Well, the fish itself was fried nicely being moist on the inside and crispy on the outside. The sauce was typical, nothing much to talk about. We ended up getting the sauce served on the side because the fish tends to get soggy with it on top. 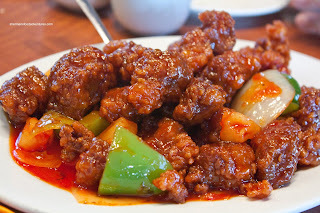 Lastly, we got the Sweet & Sour Pork. Despite its bad rep due to the perception it is a North American Chinese dish, we still love it. Goes well with rice! When it arrived, it was aesthetically pleasing with a deep red colour (more food colouring!). However, the sauce was merely sweet. No tang, no sour, no nothing. The meat itself wasn't bad per se, it was fairly moist. But for some reason, it was dense. Possibly a refry? Most Chinese restaurants cut cooking time by frying the pork either the night before or the morning of and then refrying it to order. No problem with that if it doesn't affect the dish. In this case, it did. So after 2 meals here, it is clear the food is mostly acceptable. There is definitely better nearby, so this would probably not be a return visit. Furthermore, the service as a whole is quite indifferent and inattentive. I wouldn't go as far as saying it is bad; yet it is not a plus either.